As we learned in Module 2: Landscape, natural geologic processes can be very slow – tectonic plates move about as fast as fingernails grow – or very fast – the landslide triggered by the 1959 Lake Hebgen earthquake was so rapid that 6 people were killed “…so quick that a lifted arm would finish its movement with no aid from a beating heart” (from Link, L.W. 1961, The Great Montana Earthquake). Likewise, human actions can have instantaneous impacts – piling riprap along a riverbank can immediately stop bank erosion that might threaten the foundation of a neighbor’s house downstream – as well as slow, long term impacts – the stream flow diverted by the riprap might threaten foundation of the neighbor’s house a decade later. 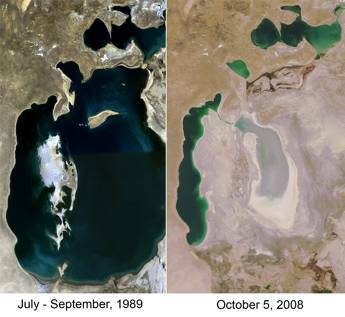 Figure 9.1: Diverting river water in 1918 to irrigate cotton fields in central Asia resulted in the reduction of the Aral Sea to 1/10th of its former size. Can you find examples of unintended consequences that resulted from construction and landscaping of your school and its grounds? You might be able to view historical images of your school on Google Earth (click the clock symbol at the top of the Google Earth screen). Consider what happens to rainwater and snow melt around your school. How do impervious surfaces affect their fate? How has the addition or removal of vegetation around your school affected natural patterns of erosion and deposition? Does the size and shape of your school affect local wind patterns? Can you predict how the landscape around your school will look in 10 years? 20 years? And finally, what can be done to improve the outlook for your school’s landscape?